John LeRoy “Lee” Parker Jr.
John LeRoy “Lee” Parker, Jr. attended Rocky Mount schools, and with the efforts of some very dedicated teachers, graduated from Rocky Mount Senior High in 1954. With a Bachelor’s degree from Georgia Tech, Dr. Parker began his mark in aerospace engineering, earned his master’s and doctorate degrees from North Carolina State. Dr. Parker holds nine patents, most while working at AT&T Bell Laboratories. These patents range from manufacturing processes to the design of high-speed electro-optic interconnection designs. 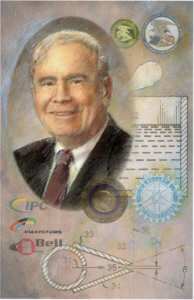 He presented and published over 150 papers in industry magazines and journals focused on communication electronics such as the “Proceedings of The Institute of Printed Circuit Board Design and Fabrication.” He served on the Electronics Realization Committee sponsored by the National Center for Manufacturing Sciences supported by the U.S. Department of Commerce. He received the Technical Paper of the Year Award at the 1996 General Meeting of the IPC and many other industrial awards. In 2013 Dr. Parker was honored to be inducted into the N. C. State University Mechanical and Aerospace Engineering Hall of Fame for his brilliant career in and contributions to the science of Mechanical Aerospace Engineering. He is also a Fellow of the NCSU Chancellor’s Circle. His expertise in electronics has had a far-reaching impact on us all. The computers in your home, the cell phone in your pocket are good examples of some of his work. Optical cables that transport intercontinental data and voice communications are another example. As the owner of JLP Consultants, he has lectured and consulted throughout North America, Asia, and Europe on technical issues concerning the electronic industry. He has been a lifelong contributor to his community. Rotary International presented him with a Paul Harris Fellow Award in 2010 for his contributions towards the eradication of polio. Habitat for Humanity and numerous animal welfare groups are a few of the organizations he avidly supports. Dr. Parker has three children, one of whom resides in Rocky Mount.